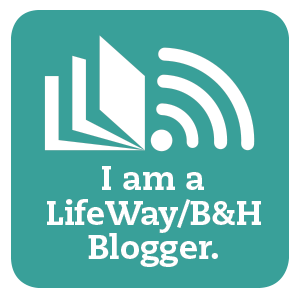 I have read different articles and books to grasp a better understanding of my children's learning challenges. One thing that is repeated in all my research is that they need to use as many of their senses as possible in all that they strive to learn. Needless to say, laziness is not an option for any of us! 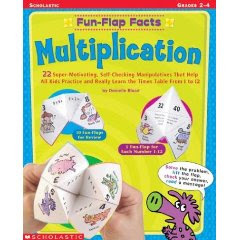 Last year I found a book by Scholastic called, "Fun-Flap Facts, Multiplication"
It seemed like a good idea since it appeals to 2-3 of the senses not to mention my 10-year-old daughter was/is really into "fortune tellers" which is the concept of these sheets (as you can see). Fun Flap Facts are a hit in my household (when I remember to drive them to using them!). The flaps in these fortune tellers are filled with all sorts of anecdotes. 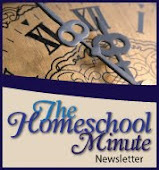 There are questions like, "Name the 12 months backwards" under the answer to 2x6. There are tongue twisters and silly sentences like, "2 kings asked 4 queens if they ate." under 2x4. Most of all they are just plain fun! I actually like this better then the Scholastic book because I can customize it to what we are studying and what skills the kids need to work on most (such as the 12 vs. 21 I am working on with my 6-year-old). I even added trivia like, "Name 2 planets" since we are still working on our solar system study. If anyone sees and likes this idea but thinks, "I can't draw", do not despair. You can use stickers! If you want directions on how to fold a fortune teller, just email and I will send them to you.